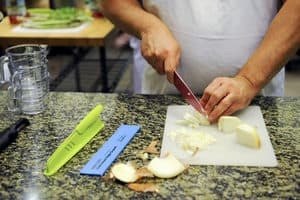 Through the ReVision Gives Back program, ReVision LASIK and Cataract Surgery is proud to make a donation to Local Matters, a Columbus-based non-profit that believes food education, access and advocacy are fundamental components of healthy communities. ReVision LASIK and Cataract Surgery shares Local Matters’ passion to bridge the gap between nutrition and healthcare. In addition to routine eye exams, ReVision encourages patients to incorporate healthy food choices into their daily diets to manage and prevent disease. Kale, orange peppers, salmon and many other foods are great sources of nutrients – such as vitamin C, lutein and omega-3 – that promote optimal eye health. Local Matters is a non-profit partnering for healthy communities. Founded in 2008, Local Matters supports the health and wellness of everyone from preschoolers to seniors. Their initiatives help families shop for, plan and cook healthy meals on a budget, develop confidence and healthy behaviors early in life, increase access to healthy foods in our communities, build a culture of health in the workplace and advocate for a sustainable food system in Central Ohio. ReVision LASIK and Cataract Surgery applauds Local Matters for being an advocate for healthy communities and encourages others in Central Ohio to engage in this non-profit’s food-focused movement. Enjoy these eye healthy recipes from your friends at ReVision LASIK and Cataract Surgery and contact us to discover how we can help you achieve clear vision for life. Arrange ingredients on a plate or in a bowl. In a separate container, combine all dressing ingredients and stir until well-mixed. Drizzle dressing over top and serve. Serves 1 as main dish. Whisk together eggs, milk, parsley, salt and pepper. Set aside. Sauté pepper and sun dried tomatoes in oil for 1 minute over medium-high heat. Add frozen spinach and continue cooking until thawed and cooked. Reduce heat to low. Add egg mixture and evenly distribute in pan. Cook on low heat until top of frittata begins to cook, approx. 5 minutes. Make sure the bottom does not burn. Flip frittata by placing a plate over top of pan, invert onto plate, then slide frittata back into pan. Cook on low for another 1-2 minutes. Remove from heat and let rest for 10 minutes. Serves 4.